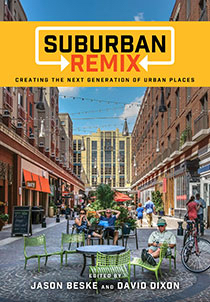 A review of the book Suburban Remix: Creating the Next Generation of Urban Places, Edited by Jason Beske and David Dixon. 2018. 330 pages. ISBN: 9781610918626. Island Press. Buy the book. For the first time in American history, more people in the suburbs are living below the poverty line than in the inner city; a reality that contradicts the original promise of the American suburb. In the course of solving a design problem, landscape architects and designers will often encounter an unexpected issue that suddenly becomes the real problem to solve and driver of the solution. Examples of this might be the discovery of a constraint that was unforeseen at the beginning: a building code, or an intangible cultural issue as one might see in a multi-family project that may have to alleviate cultural concerns about racial diversity, or disentangling the advantages of density from crowding during a public hearing. Book projects are the same. As an author begins work on one topic, uncovering facts of a particular kind or encountering a body of new and related research can redirect the book or, if the author is attentive, take the book in a completely different direction that replaces the original topic with one that is new. Suburban Remix, by Jason Beske and David Dixon, contains numerous examples of this phenomenon. Interspersed throughout a compendium of articles by some 16 contributing authors are facts, observations, and speculations that, on occasion, are eye-opening, jarring, and truly worthy of regard and concern in their own right in this book or as a freestanding book of their own. For example, in the course of delivering a practical and straightforward Introduction about creating walkable density nodes within the sparse pattern of an existing suburb, the content suddenly shifts in the middle section to illuminate the explosive rise of suburban poverty between 2000 – 2014. According to Suburban Remix, for the first time in American history, more people in the suburbs are living below the poverty line than in the inner city; a reality that contradicts the raison d’etre and original promise of the American suburb and the abundance and leafy environs it was originally intended to offer. The proliferation of suburban poverty also intersects alarmingly with another 2010 global statistic: more people are now living in mega cities than in rural areas of the planet. For devotees and practicing landscape architects in urban fields, these moments in the book are touchstones for pause and reflection. Another eye-opener arrives in the form of a rhetorical question on Housing by Laurie Volk, Todd Zimmerman and Christopher Volk-Zimmerman. “Where are the residents coming from?” Urban designers and development experts frequently extol that density offers hope. But density in service to only making the population arrays denser creates crowding and potential blight when other key ingredients such as cultural diversity, mixed-use programming, correct spatial relationships between buildings and other tenants are not equally considered. Moreover, as the “Housing” chapter surprisingly points out in its exposition, denser housing nodes require new and greater population numbers to fill them up. Just because density can be realized through policies and constructions, the authors rhetorical question of “Where will the residents come from?” leaves the reader in reflection over where the vast suburban geography of a mega city can be statistically populated even if economics can generate the infill construction. Revelatory gems such as these pave the way for a book that is largely and best written for readers with a new and first interest in urbanism. City council members, real estate attorneys, or scientists and environmentalists who have cultivated a professional or casual interest in urbanism will find the basic tone, and the user-friendly, non-jargon driven terminology both accessible and engaging. 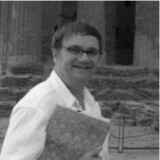 The structure and organization, using pithy titles such as “Ongoing Urban-Suburban Challenges” in the chapter on Shanghai by Tianyao Sun, or “Landing on the Right Site” in the planning chapter by co-author David Dixon, followed by brief expositions, is applied throughout the book and to all the contributors. Taken together, this gives Suburban Remix a level of concision and accessibility that will be attractive to professional groups who have the interest but not necessarily the time to wade through a lot of academicism. The middle section of the book contains a set of three sequential chapters that are each based on a particular land use, that a beginning urbanist would find instructive. In order, a chapter on “Housing”, as previously mentioned, followed by one on “Office” by Sarah Woodworth, and then a section on “Retail” by Michael Berne. The planning and economic problems that each of these uses currently experience in conventional suburbs and the potential opportunities for transformation are not only well discussed, the lessons and observations they share could be transferrable to most other cities and situations. Each of these three chapters contains a historical overview of their respective topic followed by synopses of the problems, opportunities, constraints, and potential for each category. For example, the causes of the decline of suburban retail, largely due to online alternatives, are well documented and observable across North America. However, what communities can do about the problems are well-covered here, with recommendations about how to overcome parking issues, establishing niche-driven retail mixtures, and how to rethink the idea of what kind of business can constitute an “anchor”. These are well written and productive offerings in the book. Setting aside the eye-opening gems the book periodically unveils, more literate urban professionals may find Suburban Remix a basic read. The numerous case study examples that are taken from familiar cities and locations on the United States’ east coast and around Washington D.C., such as Tyson’s Corner, which is invariably mentioned in most any new book on the New Urbanism. If there is a weakness or a lament about the book, it’s a wish that some of the case study examples were done in the vast interior of U.S., in more typical suburban geographies one might encounter in Phoenix, Kansas City, Houston, and Atlanta. Individuals who have a new found interest in urbanism and the plight of the contemporary city and suburb will find Suburban Remix a useful read and good tool for recall and reference. It was delightful to see the topic presented in such a thoughtful and accessible way. Click on the image below to buy the book. Some of the proceeds return to TNOC.